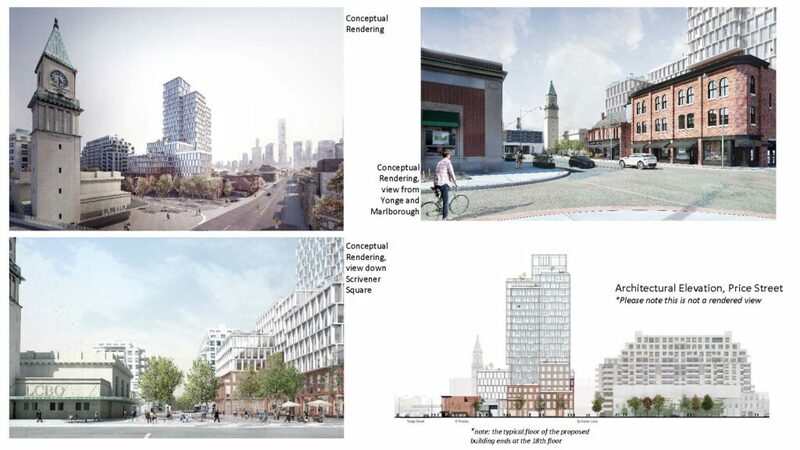 Scrivener Square Development Proposal: April 19 Community Meeting & Feedback | South Rosedale Residents' Assoc | The SRRA is one of Canada’s oldest ratepayer groups. Formally incorporated in 1931, the Association is committed to providing South Rosedale’s residents with a strong voice relative to the area’s unique position as one of Toronto’s most desirable residential communities. The South Rosedale Residents’ Association (SRRA) will host a Community Meeting on April 19th on the revised proposal for a 21-storey residential and commercial development at Scrivener Square/Price Street. The developers, Diamondcorp and Tricon, will participate. This meeting, intended for South Rosedale residents only, is to inform and update you on the revised proposal and to hear your opinions. See details below on the meeting and providing written comments. The revised (March 2018) development proposal calls for mid-rise podium buildings and a 21-storey (85.4m, including mechanicals) high-rise residential building divided into 4 quadrants, stepping up in quarters from the 18th floor to the 21st floor. The proposal has an amended overall configuration that includes the addition of public amenity/green space opposite the North Toronto Railway Station (LCBO), a new TTC Summerhill subway station entrance and several other changes. This configuration would depend on the closure and sale to the developers of the L-shaped City-owned laneway that runs through the site. The developer would deed to the City an area at Yonge and Scrivener Square as a future park. More information on the revised proposal can be found on the City’s Planning Application website – click here. The developer’s original (May 2017) proposal for a 26-storey development was presented at a City-hosted Public Meeting held in November 2017. This proposal is currently scheduled for an OMB pre-hearing in June. As previously communicated to SRRA members, representatives of the SRRA, Summerhill Residents’ Association, ABC Residents’ Association, the two Thornwood condominiums (20 and 25 Scrivener Square), and the Toronto Lawn Tennis Club, all key stakeholders, participated in approximately 10 Working Group meetings facilitated by the developer, beginning in late 2016. The non-binding revised proposal, which was recently presented and discussed at a March 20th Public Meeting hosted by the City’s Planning Department, is reflective of those Working Group discussions. The City’s Planning Department is currently developing a Planning Report which will provide recommendations on the development proposal, which will then be considered by Toronto and East York Community Council. As part of its long-standing participation in the area, the SRRA is working actively with community members, professional advisors and other stakeholders to determine how to represent the South Rosedale community’s interests in any further discussions with the developers, City Planning and City Councillor Kristyn Wong-Tam. The developer is seeking the support of the SRRA. This presents an opportunity for the SRRA to continue a dialogue on some aspects of the application, informed by input from the community and expert consultants. Both the SRRA and the developer have indicated a preference to reach an agreement on the revised proposal, and to avoid any potential risks associated with an OMB hearing on the taller and denser 26-storey development proposal.